The old Black Lions inn which stood for centuries in South Street is another of Exeter's frustratingly elusive historical buildings. Since at least the beginning of the 19th century the inn was believed to be the former townhouse of the medieval Priors of Plympton Priory. Numerous priors, abbots and archdeacons in the south west of England had residences in Exeter. It had been the region's pre-eminent religious centre since the foundation of the cathedral in 1050. The Abbots of Buckfast Abbey owned a large property in the Cathedral Close known as the Abbot's Lodge and the Abbots of Tavistock Abbey owned a house on the opposite side of South Street, later the Bear inn and now the site of the Roman Catholic Church of the Sacred Heart. Nearly opposite the church stood the Black Lions inn. But was it really the Exeter residence of the Priors of Plympton Priory? The Augustinian Priory at Plympton, approximately 33 miles west of Exeter, had been refounded in 1121 by Exeter's bishop, William Warelwast, on the site of a pre-existing Saxon minster or college. Warelwast, the bishop who built Exeter's Romanesque cathedral, was an exceptionally generous benefactor to the Priory at Plympton. By the time the Priory was dissolved during the Reformation in 1539 it had acquired numerous parcels of land in Exeter, including ground near the Bishop's Palace in Palace Gate, a large house on the corner of Fore Street with Mary Arches Street, another house almost opposite the Guildhall and a house and garden in the parish of St Mary Major. These properties were sometimes rented out and the money channelled back into the Priory which grew to become one of the wealthiest monasteries in Devon. In the light of a 19th century discovery at the Black Lions inn, it is perhaps significant that most of these tenements in Exeter were gifted to the Priory in the 12th century. An impression from the Priory's seal is shown below right. The house and garden in the parish of St Mary Major is perhaps the most likely candidate for a link between the Plympton Priors and the Black Lions inn. The tenement was situated in "Le Cokerewe" i.e. Cook Row, an ancient name for the upper portion of South Street. Also located on South Street, not far from the site of the Black Lions inn and on the same side of the street, was St George's church which until 1222 had been a daughter church belonging to the Plympton foundation. Unlikely as it may seem today, South Street was one of the four most important roads in medieval Exeter, the location of the city's most impressive gatehouse and the ceremonial thoroughfare into the city from the south east. It was once lined with a number of prestigious houses belonging to some of Exeter's wealthiest citizens. A document records that a tenement on Cook Row which belonged to Plympton Priory was leased in 1524 to John Alyn for a period of 58 years, rather optimistically considering that the Priory itself was to survive for just another 16. The new occupier was possibly John Allen, who became the city's steward in 1536. Unfortunately there is no firm documentary evidence which proves that the Black Lions inn was either the property leased to John Alyn or that it had any connection with the Priors of Plympton Priory. The name of the inn is something of a mystery. Robert Dymond suggested that "it is just possible that the Black Lions may have been for a time the town residence of the Carew family, whose shield of arms bears three lions passant, sable". The Carews were one of Devon's most prominent families throughout the late Middle Ages and Tudor period. George Carew was in command of the Mary Rose when it sank in the Solent in 1545 and the 16th century Carew monuments in Exeter Cathedral are studded in heraldry depicting the three black lions passant. 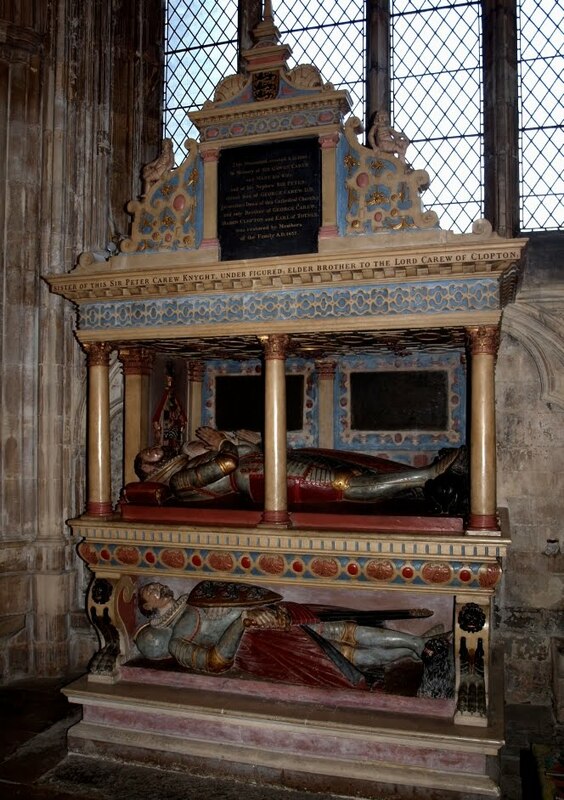 The photograph left shows one of the Carew monuments in Exeter Cathedral. The two-tiered tomb dates to 1589. The lower figure is Sir Peter Carew, depicted in an anachronistic medieval pose and carrying a shield emblazoned with the three black lions of his family's coat of arms. It's not unreasonable to believe that Dymond's theory is accurate but unfortunately there is no direct documentary evidence to support it either. Another source for the name were perhaps two carved lion heads which adorned part of the building. 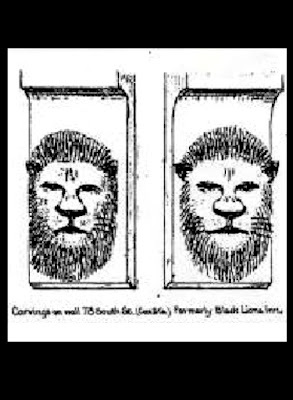 The two lions were drawn by W. G. Croump in his booklet 'Mural Monuments' of 1933 and are shown below right. The Black Lions was in existence as an important tavern and carriers' house by 1637 and in 1721 it was taken over by John Legg. The inn appears as the 'Black Lyon' on Benjamin Donn's 1765 map of Exeter. One of the first people to write about a connection between the Black Lions inn and medieval monasticism was Alexander Jenkins in his 1806 history of Exeter. Describing the inn, he wrote: it "is a very ancient building, and from its appearance, seems to have been erected for monastic purposes, it occupies a large spot of ground; in the front, which was a few years since rebuilt, is an antique carving representing an angel holding a shield, on which is inscribed the date of 1421, in ancient characters". In his history Jenkins confused the Abbots of Tavistock with the Priors of Plympton but at least he left behind an eyewitness account of the Black Lions inn itself and presumably he was merely recounting a widely-believed tradition regarding its history. It was a tradition which was repeated again and again throughout the 19th century. What exactly was it about the inn's "appearance" which made Jenkins connect it with "monastic purposes"? What was the exterior like before it was reconstructed? What was the significance of the "antique carving" and the date 1421? The fact that the inn's facade had been rebuilt c1800 probably explains why there are no sketches or illustrations of the facade, despite the inn's evident antiquity. 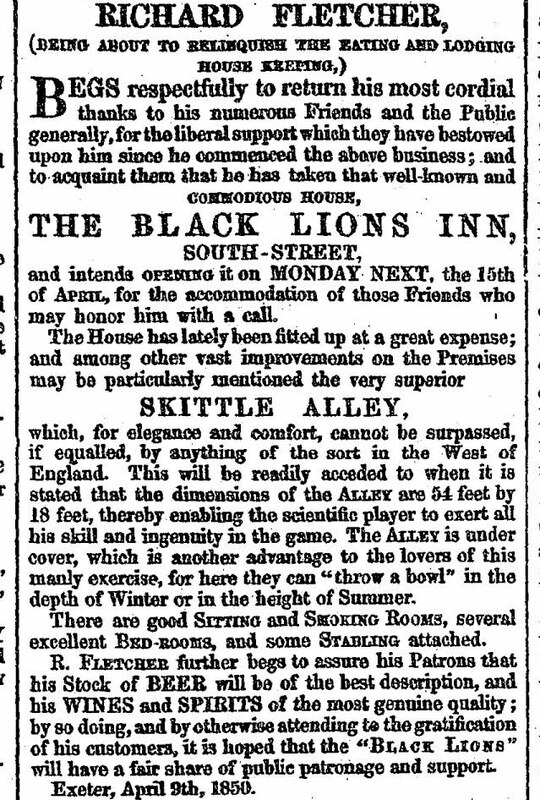 An advert below left appeared in the 'Exeter Flying Post' in 1850 in which Richard Fletcher announced that he had taken over the running of "that well-known and commodious house, the Black Lions Inn". Fletcher was re-opening the inn on 15 April 1850 after numerous "vast improvements". 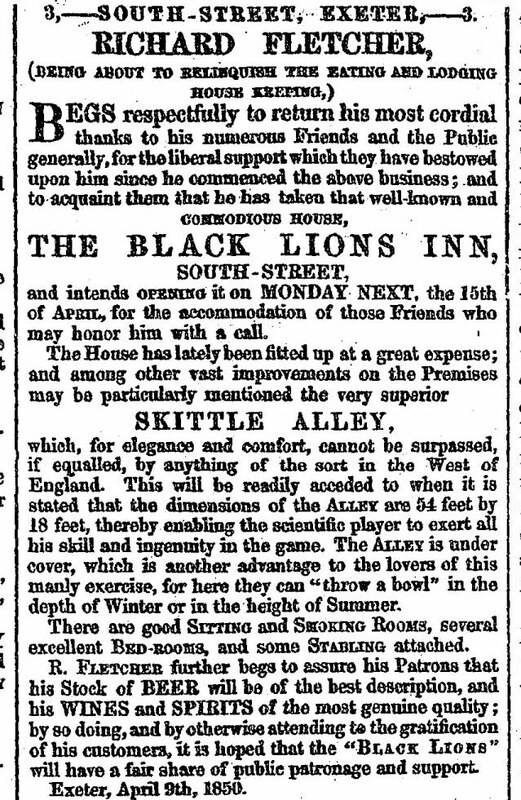 As well as a new undercover skittle alley the inn could offer "good sitting and smoking rooms, several excellent bedrooms, and some stabling attached". The premises were described in 1873 as being "very large and roomy". In the centre of the premises was a cellar. The inn formerly had a large yard at the back which was used for carriers' vehicles and which was accessed via an entrance from Sun Street. Another article in the same newspaper from 1855 repeated the claim that the inn was the "ancient town residence of the opulent Priors of Plympton before the dissolution of religious houses by Henry VIII". Fortunately the report also records some intriguing architectural details which help throw some light on the building's medieval origins. There were at least two Perpendicular Gothic windows on the first floor. One was blocked up. The other was described as being "a fine specimen" and "of four lights, foliated as usual or cusped in the head, divided horizontally by a transom". These windows were on the north side of the Black Lions and overlooked No. 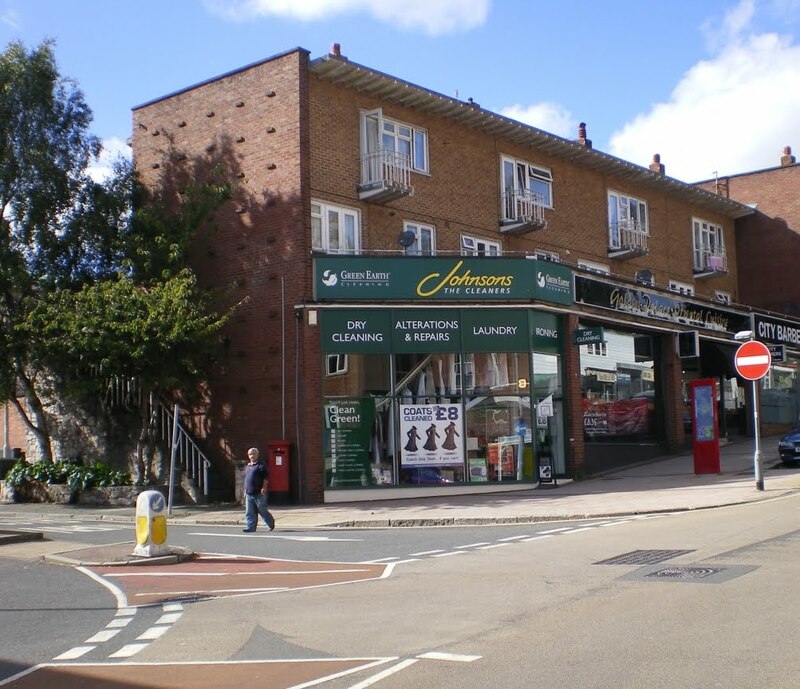 79, the premises of Harvey's gunsmiths. A blocked medieval arched entrance also existed on the ground floor. The article's author believed that the stone tablet on the front, dating to 1421, commemorated the year when a portion of the structure was built. Traces of the site's long history had already been unearthed earlier in the 19th century when a portion of a tessellated Roman pavement was discovered at the rear of the inn and in July 1834 a "curious brass religious tablet" was found "underneath the foundation". 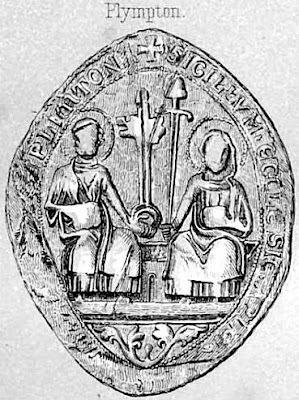 According to a contemporary report, the "tablet" was very small, approximately 5cms square, and could've been worn as a locket (although Dymond speculated that it might've been a seal for documents). On one side was a representation of Christ sat in some clouds with the Virgin Mary beneath accompanied by two saints. The Black Lions inn was largely destroyed in a major fire in September 1873. The story appeared in Trewman's 'Exeter Flying Post'. 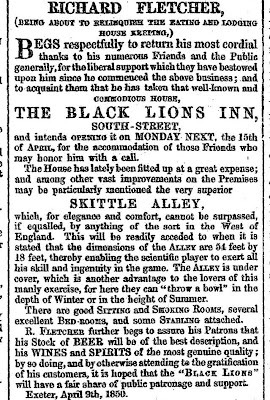 William Carter and Frederick Baker were walking down South Street at around 2am on a Sunday morning when they saw smoke issuing from the roof of the Black Lions. They watched it for several minutes thinking it was a chimney fire before heading down a passageway at the side of the inn where Carter lifted Baker up so he could peer through a fanlight. Seeing light reflected from a window they found a policeman and told him that they believed there "was a fire at the Black Lions". Some time "elapsed before the flames were visible - first through the fan-light, then gradually from one window and another until the whole front was enveloped in one mass of flame" and when the fire engines arrived "the fire had a strong hold on the premises and was burning furiously" with "dense volumes of black smoke issuing from every window". At about 3am "the front of the inn fell into the street in a burning mass and exhibited the interior, which glowed like a furnace". The air rushed inside fanning the flames "into still larger proportions" until the "roof and almost the entire building speedily sank bodily to the foundation, casting myriads of sparks towards the heavens and a lurid glare over the city." There were five people in the Black Lions at the time of the fire: Richard Fletcher, the publican; Maria Hepper, Fletcher's elderly mother-in-law; Mrs Sanders, the housekeeper; John Clarke, who worked for Fletcher, and Clarke's nine-year-old sister, Emily. Only Richard Fletcher and John Clarke survived. The inquest recorded a verdict of accidental death on the others. The surrounding buildings were also affected by the fire. Part of the gunsmith's shop at No. 79 South Street, immediately adjacent to the Black Lions, exploded and destroyed a portion of the north wall but the fire also revealed the extent of the surviving medieval masonry. At least the two side walls were left standing including "a great part" of the north wall with its fine Gothic window intact. The south wall had also survived where "traces of deeply-mullioned Gothic windows" could also be seen. The walls were about 3ft (1m) thick and were built of the "red sandstone of the neighbourhood", presumably red Heavitree breccia. The tablet bearing the date 1421 and mentioned by Jenkins was lost in the fire, despite hopes that it could be retrieved. "Several ardent antiquaries" visited the scene following the blaze and they had "expressed a hope that means would be taken to preserve the fine old window on the north side". The detail from Hedgeland's early 19th century model of the city above right isn't particularly helpful and probably can't be regarded as an accurate depiction of the Black Lions inn. 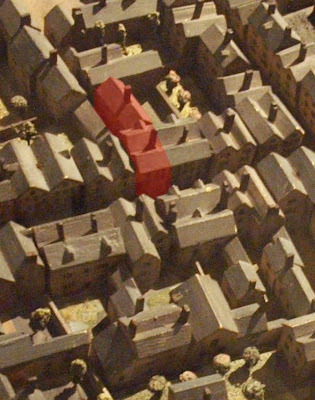 The portion of the model which corresponds with the extent of the inn as it appears on the 1876 Ordnance Survey map is highlighted in red. One remarkable find was recovered from the ruins of the Black Lions inn in 1873 as the site was being cleared: the capital of a free standing column made from either white limestone or sandstone. 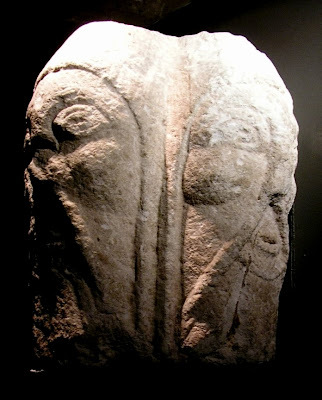 Beautifully carved into each of its four sides is the face of man wearing a cap or helmet and with a huge pointed moustache. It is clearly Romanesque work of the late 12th century and is contemporary with the acquisition of various properties in Exeter by the Priors of Plympton Priory. It was an intriguing discovery but striped of its architectural or archaeological context it has lost much of its diagnostic value. Was it part of the original fabric of the building? Where in the building had it come from? Could it really have remained in situ since the 12th century? Or was it brought in much later as a piece of decoration from another medieval site in the city, such as St Nicholas's Priory or even the Romanesque cathedral itself, as probably happened at the so-called Norman House in Preston Street? Either way, its presence at the Black Lions inn combined with the tradition of the Priors at Plympton Priory can't easily be dismissed. The capital was on display at the Royal Albert Memorial Museum but since the museum's refurbishment it appears to have disappeared into the stock room. 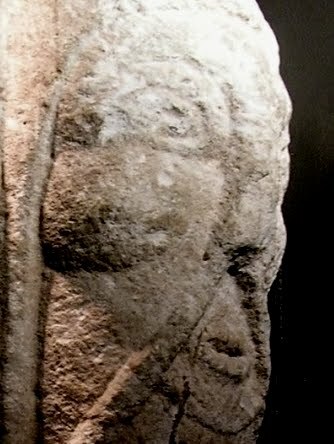 A photograph of the Romanesque capital is shown at the top of this post. A detail is shown left. The fire in 1873 would appear to have been the end of the Black Lions inn but the story has an extraordinary coda. The site of the inn was rebuilt as it was for sale again in 1892 and was still in use as an inn in 1919. During the air-raid of 04 May 1942 the building was again destroyed by fire. The following morning, stood amongst the ruins for the second time in 70 years, were the same medieval walls and Gothic windows which had first been revealed in 1873. The Victorian antiquarians had clearly succeeded in preserving the medieval remains and they must've been incorporated into the new premises when the Black Lions was rebuilt following the 1873 fire. Fortunately a local architectural historian, Arthur Everett, recorded what he saw soon after the air-raid. According to Everett, the air-raid had revealed "the greater part of the Black Lions inn in South Street". The site measured approximately 23ft wide by 63ft long. Built of red Heavitree breccia, the walls were three stories tall although only the west wall and the north wall now survived (Everett doesn't mention the south wall). Four windows remained in the north wall at ground floor level with a further three windows on the first floor including one which was "of two lights and rather ornate". Everett believed that the first floor was the "principal apartment" of what was once clearly a very extensive medieval property. Everett also reported that there was a "large Georgian house" with the date 1754 on a rainwater head that stood at the back of properties on Sun Street to the north. According to Everett, this house was built over a basement which was medieval in origin and which had a 15th century doorway in it. (Paragon House, an earlier brick-built property on South Street which stood just to the south of the Black Lions inn until 1942 had also retained medieval elements.) The mid-18th century house was destroyed during the air-raid of 1942 along with its cellar so there is no way of investigating further, but Everett suggested the intriguing possibility that this property and the Black Lions inn formed the north and south ranges of a quadrangular residence. The image right shows part of the 1905 map of Exeter overlaid onto a modern aerial view of the same area. The Black Lions inn is highlighted in red. The South Street Baptist Chapel and the Roman Catholic Church of the Sacred Heart are on the opposite side of the street. The evidence for the Black Lions inn being at least part of the Exeter residence of the Priors of Plympton Priory is compelling. The medieval building was a substantial structure and there are several precedents in Exeter for large ecclesiastical houses being constructed around a quadrangle. A single range from one such building, the courtyard house of the medieval Archdeacons of Exeter, still remains in nearby Palace Gate and there are several others in the Cathedral Close but it was a layout which was never anything but rare in the city and nearly always associated with ecclesiastical dwellings. The South Street building had high status Gothic windows which are at least suggestive of an ecclesiastical origin. If the Priors of Plympton did have a townhouse directly on South Street then it was almost certainly on the site of the Black Lions inn. It's also possible to theorise about the history of the building's construction. The Romanesque capital found in 1873 could conceivably have been part of a 12th century version of the property but the Perpendicular windows are a big clue that the complex was substantially rebuilt in the 15th century. It seems that the vast majority of the walls were constructed from red Heavitree breccia, a stone which wasn't quarried in any great quantity in Exeter until the middle of the 14th century. Perhaps the date of 1421 recorded the completion of the modifications. A number of similar buildings in Exeter were also reconstructed at around the same time along with many of the city's parish churches. 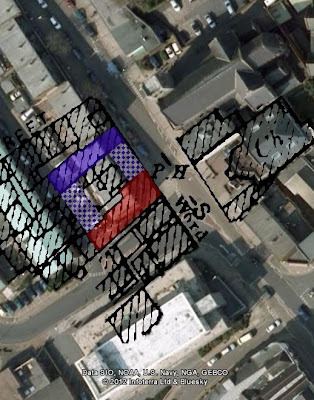 If it was indeed built around a quadrangle then there was probably a gatehouse range to the east which gave access into the courtyard via South Street with perhaps a service range to the north. To the west a further range possibly consisted of a hall for dining and entertaining. Everett's "principal apartment" was in the south range and might've contained the private chambers used by the Priors of Plympton when they resided in Exeter. 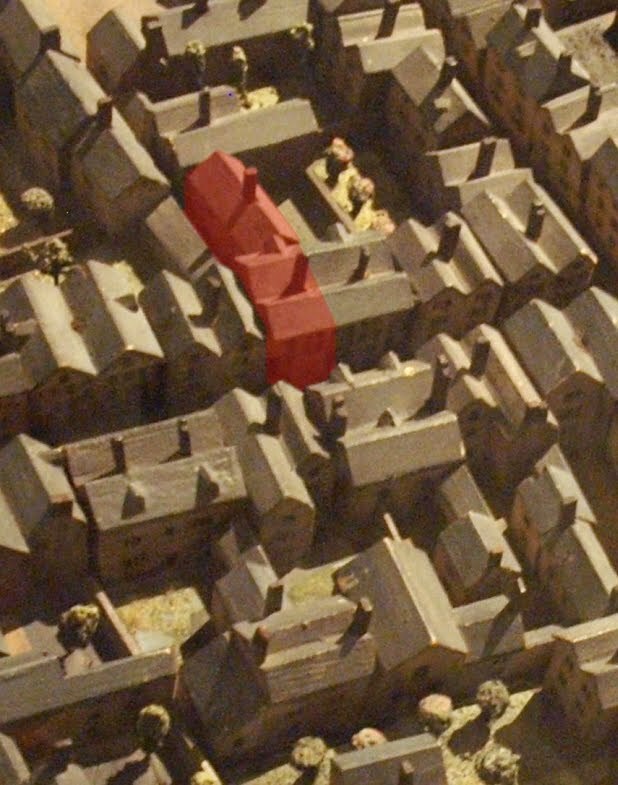 The image left shows the Black Lions inn highlighted in red. 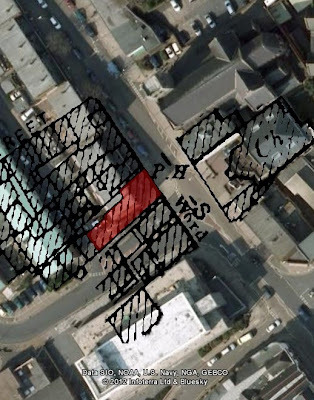 What might've been the north range described by Everett was possibly on the site of a group of buildings called Victoria Place, although the exact location of his Georgian house of 1754 is uncertain. The projected north range is highlighted in purple. Also highlighted are what might've been the sites of the east and west ranges, the four ranges creating a four-sided courtyard house. Was evidence of the quadrangular arrangement of the buildings still apparent when Jenkins described it in 1806 and is that what he meant when he referred to the inn's "appearance" revealing its "monastic purposes"? The fact that there were Gothic windows on the sides of the Black Lions inn meant that they must've looked out onto an open area when first installed in the 15th century. A courtyard at the side of the inn is noted in the 1873 report of the fire and traces of it are still visible on the 1905 map. No mention of a western hall is made by 19th century antiquarians so presumably, if it had ever existed, it was demolished by c1850 at the latest. The same probably applies to the eastern gatehouse range although it's possible that traces of it remained in the buildings fronting onto South Street as late as 1942. Perhaps the northern service range was replaced with the Georgian house of 1754 as seen by Everett although it apparently retained its medieval cellars. The southern range alone survived, altered over the centuries and evolving into the Black Lions inn whose walls remained standing in South Street following the air-raid of 1942. This is all supposition. It sounds plausible but much depends on the medieval building being quadrangular in its plan and with all of the buildings now destroyed there's no way of testing the theory. Having survived the fire of 1873 and the bombing of 1942 the extensive medieval walls and Perpendicular windows of the Black Lions inn were, in the words of Arthur Everett, "wantonly destroyed, after the raid" by Exeter City Council as part of the post-war reconstruction of South Street. Today there is no sign above ground that the inn or the medieval townhouse ever existed and only the Romanesque capital survives as a fragment of one of Exeter's most historically interesting buildings. The shop on the corner of South Street and the post-war entrance into Market Street below now stands on the site of the Black Lions inn.